Jason ArthursMajesty Shredding was a surprise on many levels: most obviously that it existed at all, coming almost a decade on from Superchunk’s last record, but also that it was so damn good. Rather than continue with the more contemplative and textured tones of their last couple of pre-hiatus records – which have their own strengths, make no mistake – they opted to channel their much more matured songwriting instincts through the adrenalized punkish power-pop of their most beloved records and majesty did indeed ensue. That record felt like such a gift that hoping for a follow-up, let alone one as good, seemed too much to ask. 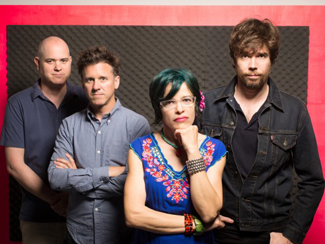 As it turns out, we didn’t need to – Superchunk were going to do it anyways. The cheekily-titled I Hate Music remarkably carries forward almost all the momentum of Shredding. Perhaps with an iota or two less energy, maybe a slightly slower overall BPM, but it’s still bursting with hooks delivered via thick guitar riffs and leads and Mac McCaughan’s still-waiting-for-puberty vocals. It’s the same recipe that served them well in helping create the template for college rock in the ’90s and retains its potency today, its appeal not in nostalgia but in the timeless appeal of great songs played loudly and with passion. Through fuzz pedals. There’s a temptation to equate Superchunk’s fruitful second act with their having discovered a fountain of youth or gone back in time, but there’s something about Shredding and Hate that sounds like they could only have been made by those who’ve got some years under their belts. A band who took enough of a break to maybe no longer need to make music together, but instead want to. They’re the sound of a great band having fun and just loving music. I Hate Music is out next Tuesday, August 20, but available to stream in whole now at NPR. Crocodiles also have their new record Crimes Of Passion streaming at NPR before it’s in stores next week. They’re at Lee’s Palace on November 19. Head over to Nylon to hear a new track from the forthcoming Blouse record Imperium, coming September 17. With Brooklyn electro-dream-pop trio Au Revoir Simone announcing a September 24 release date for their new record Move In Spectrums – a new video was just premiered at Spin – it logically follows that they’ll be on tour – and so they are, stopping in at The Drake Underground on October 20. Interview, The New York Times, co.create, and Rolling Stone talk to Explosions In The Sky about recording the Prince Avalanche soundtrack, from which they’ve just released a new video. They play The Air Canada Centre on October 4 in support of Nine Inch Nails. After a few near passes during festival season, Steve Earle has finally announced a Toronto date in support of his latest record The Low Highway; he and The Dukes will be at Massey Hall on October 29, tickets ranging from $35 to $64.50. The Edmonton Journal has an interview with Earle. NPR is hosting the premiered of the new video from Ra Ra Riot, taken from their latest record Beta Love. The Daily Swarm asks James McNew about the secret to Yo La Tengo’s longevity. Under The Radar and Vita.mn talk to Matt Berninger of The National. John Darnielle talks to NPR and Salon about the making of The Mountain Goats’ recently-reissued All Hail West Texas. Just in case it slipped through the cracks (and apologies if you simply chose not to address it). I did see, will be dedicating tomorrow’s post to him. Never mind… assumed that might be the case… but haven’t seen any North American sites reporting it yet so figured I’d mention it. actually the AP story has been picked up by CTV, The Globe, probably others. A bit surprised they’ve bothered – Charlatans not really a band with any traction in the broader consciousness. Crazy – hadn’t seen any of that. Weird… had a friend forward the Independent and BBC coverage and that’s all I’d seen. Glad people are paying attention – even if it is a little odd LOL.